What a day yesterday was, rain, rain and then some more, the most I think I've seen hereabouts in about 6 years. It was the big pick-up job this morning in the yard, our native ash and lemon-scented gum managed to shed numerous small branches along with the poinciana out the back which has gone berserk over the last few weeks with all the rain we've had. Pictured left is our pretty flowering gum which only stands about 18" high in the front yard but doesn't look quite so pretty today, in fact it's decidedly bedraggled this morning. Back to work today and earlier flights than usual although I can't remember why - must have been some booking difficulties. I get into Townsville fairly early this evening so I thought it would be a good chance to catch up with dear daughter, S, who's recently split up with her boyfriend and also just lost her job. But no, she's off to the movies with a friend, a parental shoulder to cry on is obviously not necessary, nor the lure of a decent meal. Eldest daughter has also managed to persuade my ex to join Facebook. I know you can have friends on Facebook (I've got 12, getting into the big time now...), can you also have enemies ? Oh, sounds like you fared much worse than us in terms of clean up operations. At least your plane is flying today. I am still on the "not sure" list about facebook - if you know how it works I am sure it is wonderful, but I am sure I am making enemies out of friends with the device. I do hope that those flowers have gained back their natural beauty by the time I've made this comment. 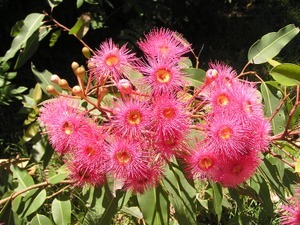 Those flowering gums really look beautiful, if you ask me. Good luck in taking care of your garden!